To Cite: Bae J, Kim E H. Epstein-Barr Virus Infection and Risk of Breast Cancer: An Adaptive Meta-Analysis for Case-Control Studies, Arch Clin Infect Dis. 2016 ; 11(3):e34806. doi: 10.5812/archcid.34806. Context: The association between 'Epstein-Barr' virus (EBV) and breast cancer risk still remains controversial. A Systemic Review (SR) published in 2012 reported that there might be a statistically significant association between EBV and risk of breast cancer. However, errors were found in the appraisal process of the concerned SR. Objectives: The aim of this report was to conduct an adaptive meta-analysis with additional extraction of relevant papers published up until September 2015. 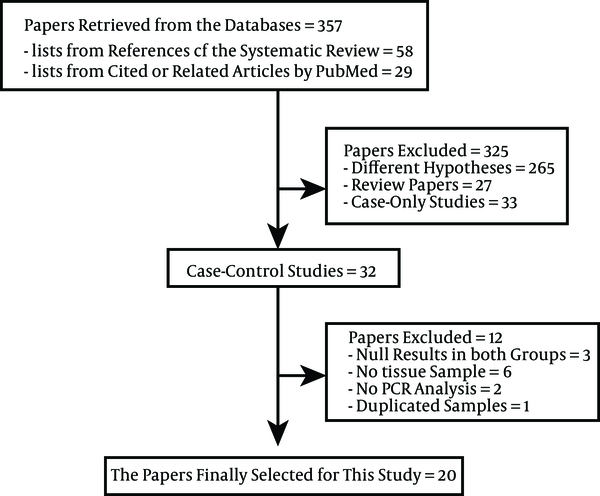 Data Sources: The lists of references, cited articles and related articles provided by PubMed were made using the articles selected in the previous SR.
Study Selection: Among these articles, only case-control studies using Polymerase Chain Reaction (PCR) techniques to detect EBV DNA in tissues were selected. Data Extraction: The summary odds ratio (SOR) and the 95% confidence interval (CI) were calculated though meta- analysis. Results: A total of 20 case-control studies were selected, and the total numbers of subjects in the case and control groups were 1947 and 1010, respectively. The findings of this meta-analysis revealed that EBV infection might increase the risk of breast cancer (SOR = 3.84, 95% CI: 2.24-6.58; I-squared = 62.2%). Sub-group analyses by region, sample type, and control tissue showed that a statistical significance of the risk was still secured. Conclusions: The findings of the meta-epidemiological study support that EBV infection may increase the risk of breast cancer. Nested case-control studies are required in the future. Globally, breast cancer is the most frequent primary cancer among women (1). However, about half of breast cancer cases occur in economically developing countries, in young age groups (2, 3). Such an epidemiological characteristic cannot be fully explained by known risk factors (4, 5). Virus infection is known to cause about 15% of all cancers (6), and Epstein-Barr Virus (EBV) is ‘the first human tumor virus’ (7), which belongs to group-1 carcinogen (8) with association with various cancers including Burkitt lymphoma, nasopharyngeal carcinoma, and Hodgkin’s disease (9, 10). Since the proposal of the association between breast cancer and EBV in 1995 by Labrecque et al. (11), it has remained controversial to date (12). Incidentally, in order to meet the criteria required to demonstrate that a specific virus may cause cancer (13, 14), a case-control study instead of a case study is required (15). However, tumor-based case-control study using cancer tissues has a drawback of making measurement errors (14, 16). In order to overcome the limitations, a systematic review (SR) is considered necessary. Huo et al. (17) performed a SR on 10 case-control studies published up to September 2010 and reported a 6.8-fold (95% confidence intervals, CI: 2.13-18.59) increased risk of breast cancer with EBV infection. 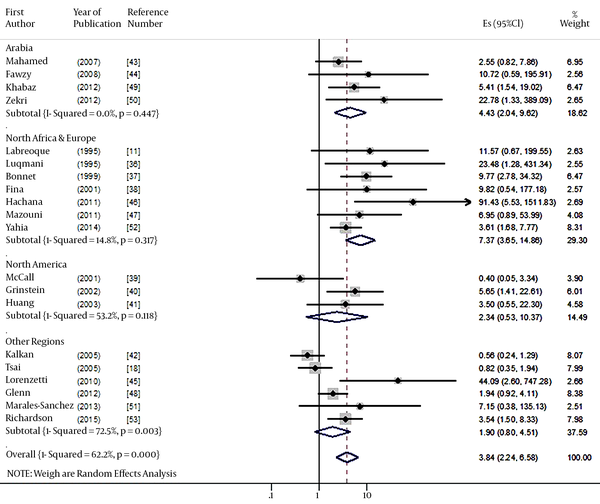 However, looking at the forest plot that shows the results of meta-analysis of the concerned SR, we identified that the Odds Ratio (OR) value by Tsai et al. (18) contained errors, where the information of the case group and the control group were reversely entered. In addition, the two papers (19, 20) reported by the same author in 2003 and 2005 had applied an overlapping meta-analysis. The presented summary odds ratio (SOR) with these errors is likely to be overestimated than actual. The aim of this study was to perform an adaptive meta-analysis for examining the association between EBV infection and breast cancer by extending the publication period of articles up to September 2015. Considering the fact that we were reanalyzing an already published SR (17), hand search strategy was applied instead of an electronic search (21-23). With an assumption that studies conducted with the same research hypothesis have a high likelihood of citing the articles included in the original SR, adaptive meta-analysis (AMA) was conducted (21-23). As the citation discovery tools such as ‘cited by’ and ‘similar’ tools in PubMed (www.ncbi.nlm.nih.gov/pubmed) is enough to conduct an AMA (21), the list of “cited articles” and “similar articles” from PubMed of each article, selected by Huo et al. (17), was secured. The publication period of articles included in the list was until September 2015. The inclusion criteria were case-control studies, which met the criteria set by Huo et al. (17), and used tissues as samples and polymerase chain reaction (PCR) for EVB-DNA detection in tissues. Therefore, based on the titles and abstracts of the combined lists, the following three exclusion criteria were primarily applied for the final selection: different hypothesis, expert reviews or systematic reviews, and case only studies. For the remaining case-control studies, the following conditions were excluded: (1) if there were no EBV DNA positive subjects in both the case group and the control group, (2) when the samples were not tissues, (3) when PCR techniques were not used and (4) when duplicate samples were reported. After applying the above seven exclusion criteria, the remaining case-control studies were selected for the final analysis. The application of the exclusion criteria for each article, and EBV-related information, including, the number of detection tests and the number of positive DNA diagnoses in each of the subject and control groups, nationality of the subjects, type of sample, and kind of control tissue, were processed by two researchers. As the selected articles were case-control studies dealing with DNA detection, the appraisal of quality of evidence was not conducted. The OR and 95% CI for each study was calculated by utilizing the number of EBV DNA positive and negative diagnoses in case and control groups. The region was categorized into Arabia, North Africa and Europe, North America, and other regions using nationality. The samples were divided to two groups of paraffin-embedded tissue (PET) and fresh frozen tissue (FFT). The control tissues were divided into adjacent non-cancer tissue (ANT) and normal tissue (NT). Heterogeneity across the studies for performing meta-analysis was assessed based on the I-squared value (%). The SOR and its 95% CI, according to the random effect model were primarily obtained. Egger’s test for small-study effects was performed to examine publication bias (24). In the presence of a publication bias, sensitivity analysis was performed only when the standard error of logarithm OR (s.e. 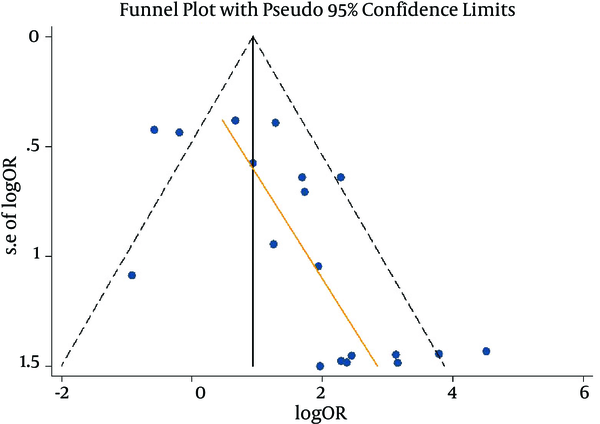 log OR) in the funnel plot was less than one. Statistical significance was set at 5%, and STATA version 14 (www.stata.com) was used for the analysis. Figure 1 shows the flow chart of article selection for meta-analysis through data retrieval from the database. Lists of 58 references and 299 cited or related articles by PubMed on the basis of SR (17), to determine the level of breast cancer risk, were acquired. When the exclusion criteria were applied to the total of 357 articles, 32 case-control studies were selected. Among these, (1) three studies in which EBV-DNA was not detected in both the subject and the control group (25-27), (2) six studies in which the samples were not tissues (28-33), (3) two studies not using PCR (34, 35), and (4) one study that used duplicate samples (20) were excluded. A total of 20 studies were finally selected for meta-analysis through the above-mentioned exclusion process (11, 18, 36-53). Table 1 shows a summary of the EBV-DNA positive subjects according to nationality, types of sample, and kinds of control tissue in the 20 selected studies. From the results of Bonnet et al. (37), two specimens of male breast cancer patients were excluded. Accordingly, from a total of 20 case-control studies, 1947 were cases and 1010 were controls. When sorted by region, there were seven studies in Northern Africa and Europe, six studies in Arabia, and six studies in other regions. When sorted by the types of samples, there were nine studies using paraffin-embedded tissue (PET), nine studies using fresh frozen tissue (FFT), and two studies using both. And there were eight studies using adjacent non-cancer tissue (NAT), 11 studies using normal tissue (NT), and one study using both, in control tissues. Abbreviations: CI, Confidence Intervals; FFT, Fresh Frozen Tissue; NAT, Adjacent Non-cancer Tissue; NT, Normal Tissue; PCR, Polymerase Chain Reaction; PET, Paraffin- Embedded Tissue; Ref, reference number; OR, Odds Ratio. When a meta-analysis with random-effect model was performed for the 20 studies, the risk of breast cancer (SOR) based on EBV DNA positive detection showed a 3.84-fold increase (95% CI: 2.24 - 6.58: I-squared = 62.2%) (Figure 2). The results of the Egger test to examine publication bias indicated a bias coefficient of 2.01 and a standard error of 0.64, showing statistical significance (P = 0.006) (Figure 3). As publication bias was identified, sensitivity analysis was performed for the ten studies with s.e. log OR value of less than 1.0 in the Funnel plot. The Egger test resulted in a bias coefficient of 3.05 and a standard error of 2.04 without statistical significance (P = 0.17), while the SOR was 2.57-fold (95% CI: 1.46 - 4.51: I-squared = 67.6%), still having statistical significance. Log OR, logarithm odds ratio; s.e., P value of Egger’s test (= 0.006). The results of sub-group analysis by region, types of tissue sample, and kinds of control tissues are summarized in Table 2. By region, the SOR was 4.43 folds (95% CI: 2.04 - 9.62) in the Arabia region and 7.37 folds (95% CI: 3.65 - 14.86) in the Northern Africa and Europe region. By tissue sample, it was 3.97 folds in PET (95% CI: 1.40 - 11.22), 3.67 folds in FFT (95% CI: 1.90 - 7.12); all showing statistical significances. Both SORs of NAT and NT showed statistical significances. Abbreviations: CI: Confidence Intervals; FFT: Fresh Frozen Tissue; NAT: Adjacent Non-Cancer Tissue; NT: Normal Tissue; PET: Paraffin-Embedded Tissue; Ref: Reference Number; SOR: Summary Odds Ratio with random-effect model. Meta-analysis of the 20 case-control studies revealed that the risk of breast cancer associated with EBV infection was 3.84 folds higher (95% CI: 2.24 - 6.58). In the sensitivity analysis of the ten studies, with s.e. log OR of less than one, and with regards to possible publication bias, the results still showed statistical significance. The aforementioned risk was lower than the SOR of 6.29 reported by Huo et al. (17), but as it was entirely included in the proposed 95% confidence interval (2.13 - 18.59), it can be interpreted that the estimated risk had become more accurate. In other words, the strong point of this updated SR was that it calculated a more accurate effect size. By region, statistical significance was found in Arabia, North Africa and Europe, but not in North America and other regions. However, the number of related articles was small in the regions where a statistical significance was not obtained, and as the I-squared values was all above 50%, it is difficult to conclude that the risk of EBV may differ depending on region. The two regions showing statistical significance, had concerned articles of 4 and 7 each, and there was homogeneity in terms of the I-squared values (Table 2). Meanwhile, considering that the regions showing high statistical significance in this SR were Mediterranean-neighboring countries known to have high EBV prevalence, it may be interpreted that the risk of breast cancer could alter depending on EBV prevalence by region (5, 17). Sub-group analysis was performed by dividing the samples into PET and FFT and both, but all showed statistical significances, and SORs were found to be similar. These results indicate that despite the controversial DNA detection of human papillomavirus (54, 55), it was not a problem for EBV DNA detection (13, 17). The subgroup analysis by types of control tissue also showed the same findings. The main problems that have caused the controversy about the association between EBV infection and breast cancer were that the impact of the aforementioned EBV prevalence level not being considered and that the experimental methodology of EBV has not been standardized (5, 17, 34, 56). Several kinds of tests for EBV detection have been developed (57). While PCR shows a high sensitivity and specificity for the detection methods (5), Immunohistochemistry (IHC) shows a low degree of accuracy (17). Therefore, the two case-control studies adopting the IHC method (34, 35) were excluded from the selection of studies for SR. The hand searching strategy with AMA was applied rather than electronic searching in this SR (21). As a result, four articles could be additionally identified (36, 39, 41, 43), which should have been included in the SR by Huo et al. (17) who performed an electronic search for articles published up to September 2010. Furthermore, an additional nine case-control studies published (45-53) thereafter were additionally acquired. The lists of 20 case-control studies selected for this SR may be utilized as an important list for additional adaptive meta-analyses in the future. Various evidence for the association between EBV and breast cancer has been presented (44, 50). Such evidence may provide opportunities for the pathogenesis, early detection and prevention of breast cancer (5, 58, 59). In particular, along with the reports of worse prognosis of EBV DNA positive patients than the negative patients (12, 34, 37), this can be applied to the treatment of breast cancer. In conclusion, the results of SR on the 20 case-control studies support that EBV infection may increase the risk of breast cancer. In order to reduce further controversy, case-control studies that more strictly match by type of tissues and detection method are required in the future. For such studies, frozen samples through cohort construction should be used in nested case-control studies in the future. Authors’ Contribution: Jong-Myon Bae: developed the original idea and the protocol, extracted and analyzed the data, interpreted the results, wrote the manuscript and was the guarantor; Eun Hee Kim: searched and abstracted the data. Funding/Support: This study was supported by a grant from the Korean Foundation for Cancer Research, Seoul, Republic of Korea (2013-2). Conflict of Interest: All authors declare that they had no conflict of interest. 8. Epstein-Barr Virus. IARC Monographs-100B.